Two (2) bottles of 32oz. “Bold & Spicy” and two (2) bottles of 32oz. 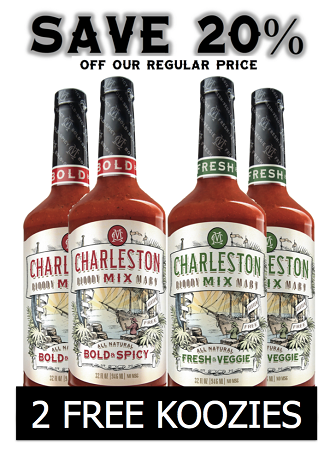 “Fresh & Veggie"
Charleston Mix Bloody Mary products are made with an indubitable collection of premium, natural ingredients that have been native to Lowcountry pantries for centuries. Our recipes are horseradish-free and feature a unique blend of habanero mash, apple cider vinegar, Worcestershire sauce and spices for enticing heat and flavor. Both mixes are also all-natural, gluten free and contain no MSG or high fructose corn syrup – try saying that about any other Bloody Mary mix on the market with taste as tantalizing as Charleston Mix! Try both our original “Bold & Spicy” mix and “Fresh & Veggie” and you decide which is your favorite! Charleston Mix is the Bloody Mary, perfected. Two (2) FREE Charleston Mix koozies with the purchase of a Bender 4-Pack!